One of the many bases I cite for the argument that state-on-state war, when compared to the great expanse of human history, has pretty much gone away. I try not to link to too much of Dr. Barnett’s stuff, mostly because you should all be reading his blog already, and also because I feel like I want to link to most of his blog entries, since I agree with almost all of them, so how do I choose? Here he links to the miniAtlas of Human Security, which has some amazing information. For instance, the number of deaths in state-on-state warfare has dropped to a historically low level. 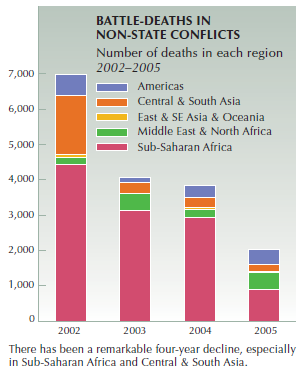 Deaths in non-state conflicts also showed a remarkable drop from 2002-2005. 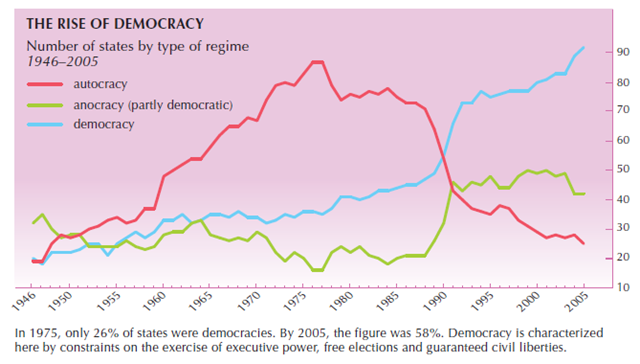 Meanwhile, the number of democracies in the world has skyrocketed, while the number of autocracies has plummeted. It all adds up to one overwhelming fact: the world is more at peace today than it’s ever been. With globalization clearly taking a dominant role in the lower-right structures of governments around the world, and therefore impacting the lower-left cultures of those nation-states, our planet continues to grow more peaceful as the years and decades roll on. Much more good information is found in the miniAtlas. 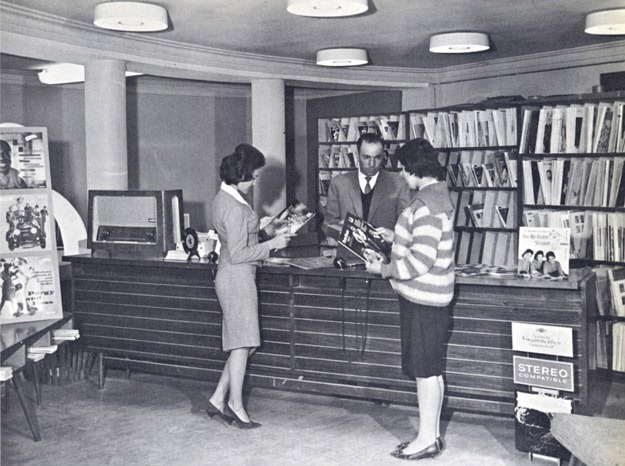 These are amazing pictures, no doubt cherry-picked by the government at the time, but unthinkable today, of a Kabul that was westernizing in the 1950’s and 1960’s. Western clothing, record stores, medical labs… and then came the Islamic Revolution next door, and the Soviet invasion, and then a civil war, and then the Taliban takeover, and then the U.S. invasion. Many assume that’s all Afghanistan has ever been — an ungovernable land where chaos is carved into the hills. Given the images people see on TV and the headlines written about Afghanistan over the past three decades of war, many conclude the country never made it out of the Middle Ages. But that is not the Afghanistan I remember. I grew up in Kabul in the 1950s and ’60s. When I was in middle school, I remember that on one visit to a city market, I bought a photobook about the country published by Afghanistan’s planning ministry. Most of the images dated from the 1950s. I had largely forgotten about that book until recently; I left Afghanistan in 1968 on a U.S.-funded scholarship to study at the American University of Beirut, and subsequently worked in the Middle East and now the United States. But recently, I decided to seek out another copy. Interesting. Here’s a snapshot. Two dozen more come with the article. Never forget that development is rooted in time, and that things rooted in time can both flourish and deteriorate. There is no guarantee of unbroken upward development, and Afghanistan is your proof. It breaks my heart, really, to see what this country has been through, and will be through for another decade or so. But globalization is coming… and once that gets into the system it’ll be hard to stop. I look forward to visiting Kabul 20-25 years from now… it’s going to be glorious. Again.